We were driving down a forsaken stretch of dirt road recently when I spotted some ladies'-tresses orchids that were growing by the side of the road. I exclaimed to the boys, "Hey, orchids!" as I slammed on the brakes and backed up to have a look. 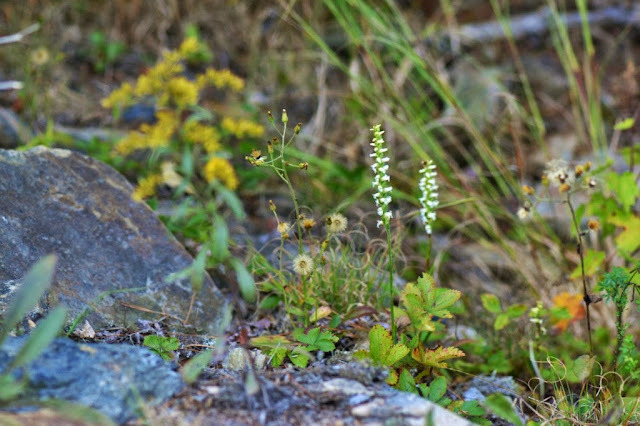 Yes, there they were.... a couple of ladies'-tresses orchids with their spiraling spikes of small white flowers. After getting out and exploring the vicinity, we found quite a number of these orchids growing on a wasteland of old stripping piles through which the road had been cut. Here is a photo of my camera and tripod set up to take photos of the orchids. There's not much of a road. Perhaps it's good it was practically an abandoned road, for a few yards down the road, I knelt to take some of the photographs and to take in the faint, pleasant scent of the orchids. I wish I could describe their sweet scent. 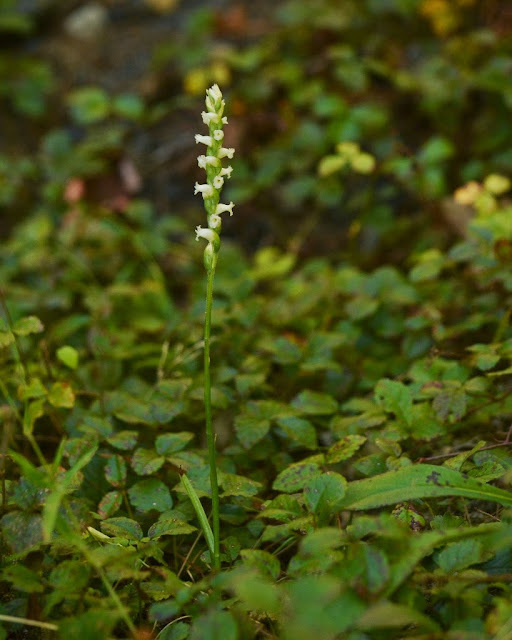 There are many species of ladies'-tresses and they are hard to tell apart. I think these might be Yellow ladies-tresses (Spiranthes ochroleuca) because of the habitat where they were growing and the time of year they were blooming. A ladies'-tresses orchid pollination system. 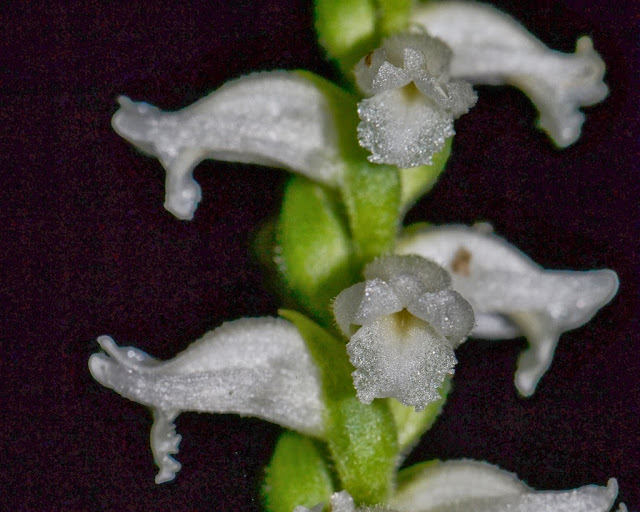 You may know that I am fascinated with the variety of pollination mechanisms that orchids employ to insure cross-pollination. 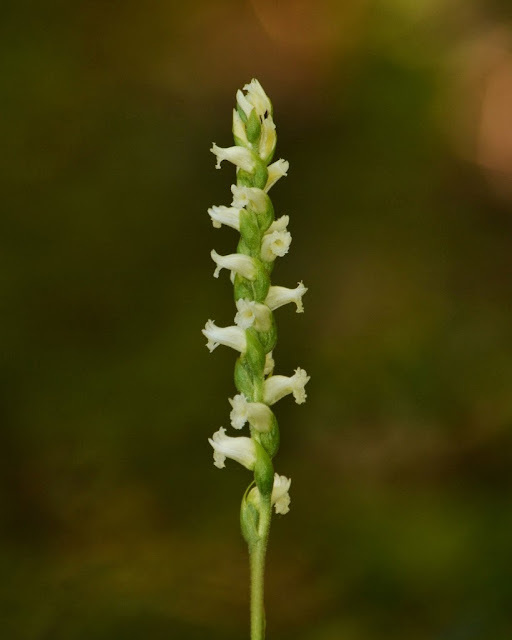 These particular ladies'-tresses orchids are no exception, so I might as well share with you, my worldwide readers, what I pointed out to the boys (and others). First, notice how the flowers spiral up the stem. The lowest flowers on the spike open first, so the ones further up are 'younger'. As the flowers 'age', the internal structure of the flower changes and they effectively turn from male flowers into female flowers. That means the younger, male flowers are near the top of the spike. 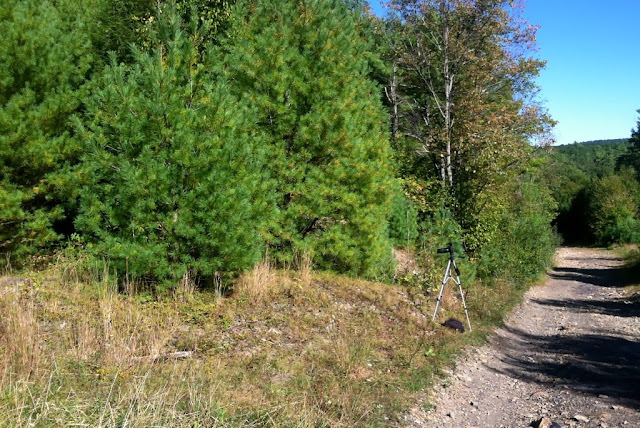 Now, let's picture how that works to help insure cross-pollination. Generally, the visiting bees (bumble bees) will work their way up the flower spike... thereby visiting the older (female) flowers first with pollen from another ladies'-tresses. Then, when the bee visits the higher, younger, male flowers, some pollinia are strategically lurking where they can be glued to the bee's probing proboscis.... to be carried away to another ladies'-tresses growing elsewhere. 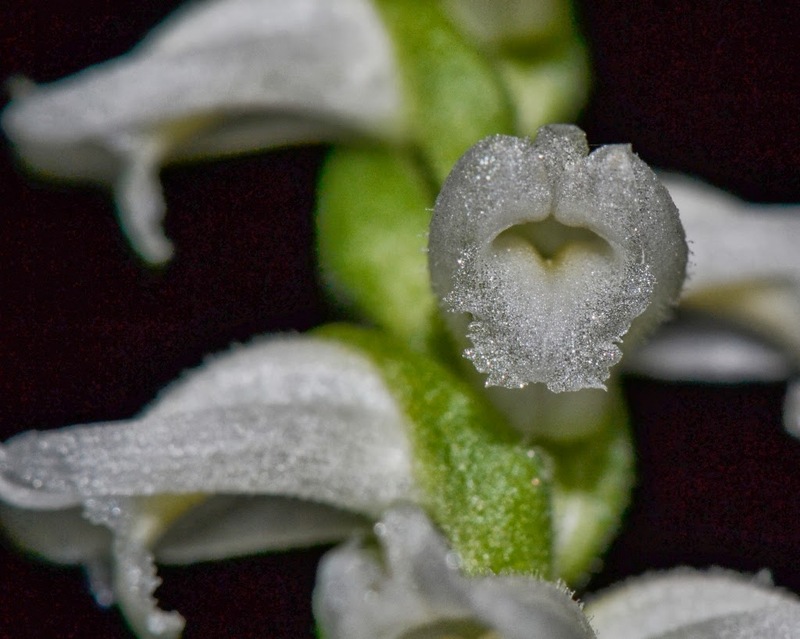 I labeled the orchid's pollination system in this photo of a cross-sectioned orchid. In a young flower, the viscidium (basically a strip of glue) is positioned close to the 'throat' of the flower where it will easily come in contact, and adhere to, the bee's 'tongue' as the bee sips nectar. The viscidium is connected to the pollinia, or packages of pollen, as a way to attach the pollinia to a transport mechanism. As the flower ages, the viscidium grows farther away from the 'throat' of the flower (more out of the way) and the stigma is better exposed to contact from pollinia from other flowers. 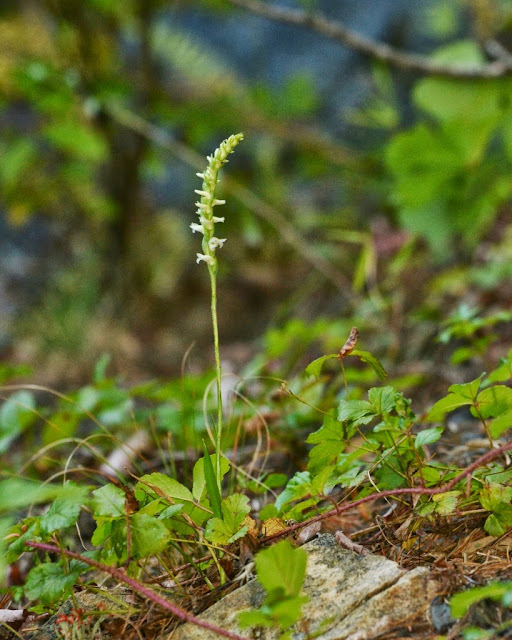 These ladies'-tresses orchids may have been growing in a forsaken location, but now perhaps, they have been appreciated all over the world. How cool is that? I guess that's what happens when a blogger sees an ingeniously designed ladies'-tresses orchid growing by the side of the road. These are great! Keep posting! I "think" I've seen these in Nova Scotia. Will have to look closer next time. Thanks Dana.